January 6 is the feast of our first Holy Cross saint, St Andre Bessette CSC. He was a French Canadian Holy Cross Brother who died in 1937 and a million people came to his funeral at St. Joseph Oratory in Montreal. 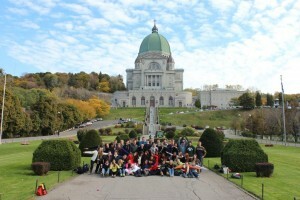 Like the picture shown I was on pilgrimage with students of Holy Cross High Schools in the United States when I was campus minister at Notre Dame High School in Niles Illinois. St Andre had a great love for St. Joseph and in his ministry as doorkeeper at the College across from the present day Oratory he drew countless numbers seeking help in mind, body or spirit. His love for Joseph lead to efforts to build a place where people could come and pray to him for healing needs. The building was nearly completed before he died but at the current building you can see the effects of the ministry today that continues in his intercession. There is an area off the main sanctuary where crutches have been left from people who have been healed. One of the students stopped and prayed for a friend who has a crutch to help him walk due to an accident. He felt this was one way he could help him and he did say that he was able to recover from the accident about a month after this prayer. There was a young boy there who had cancer and his family and friends were there in prayer with him. The smile of that youngster was radiant and made my year. Young and old, rich and poor, races and creeds were there going up the steps on their knees in prayer. Our group did the same and it was amazing seeing how these young people who could stay up all night as they had lots of energy were so quiet in our prayer up the path to the Oratory. One big football player was in tears as he prayed for his grandfather who had a bad heart and another, a cheerleader, was deep in prayer as she prayed for her best friend who had tried to commit suicide. We were there 3 days and thousands were in prayer day and night. I don’t know if actually healings took place but what I do know is that my faith was lifted and filled in abundance. Today over 2 million pilgrims with different needs and ethnic backgrounds come to the Oratory in all types of weather, winter or summer to ask for Br. Andre’s intercession. Br. Andre in his life lived the Gospel by his compassion and hospitality. May he help us this new year of 2014 love God and our neighbor.